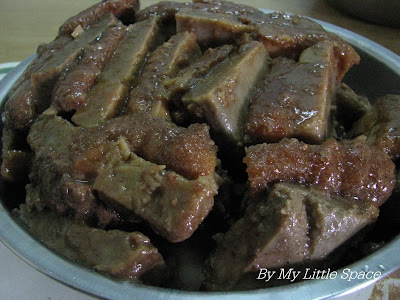 This is a typical traditional Hakka dish which is quite complicated and time consuming recipe. But I've simplified the recipe by using roast pork and has successfully done it. I brought over to my in-law's place for the Mooncake Festival celebration. Actually, this is also one of my in-law favourites. Not bad as a first timer like me making something like this...he he! This is the only time I could make red meat recipe. I don't cook this very often because my hubby and the kids are not taking red meat. I cook occasionally for my in-law though. 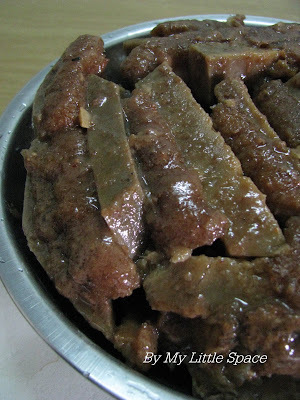 - combine fermented beancurd, soy bean paste, water, soy sauce, vegetarian oyster sauce & pepper together; mix well. - preheat pan with 2 tbsp cooking oil. 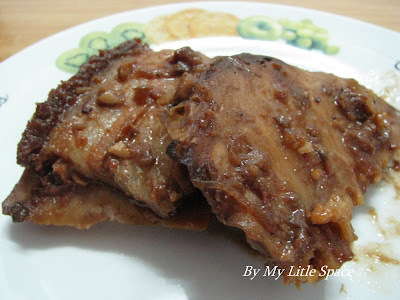 - rub sliced roast pork with five spice powder. - stir chopped garlic & onion into frying pan untill aromatic. - place in roast pork and stir fry about 2 mins or untill fragrant. - add in sauce mixture and let it simmer over low heat, cover by lid. - off the heat and leave aside. - then fry the sliced yam untill golden brown. - arrange sliced yam and roast pork alternately in a big bowl. - pour in the gravy and steam for 30 mins over high heat. - then invert onto a serving plate and serve. Oops! I was so excited to see this, so much that I forgot switching to English. I had some stewed pork belly too last two days, but with tofu sheets, which my mum sent me all the way from China. It's not easy to find some good quality yam here. I think this is original Hakka's recipe right? Will copy down and cook it one of these day. Oh, I love the combination of pork and yam. How unique. Sedap sekali ya, saya jadi lapar sekali. What a fantastic combination. It really sounds delicious. Thank you for posting this recipe, I've been searching for this recipe for the past 3 months. Will give it a go ! !